2019: LATEST: 2016 Southend Airshow still cancelled. LATEST: 2016 Southend Airshow still cancelled. Tom Curtis : "As you know, a few months back we hit a roadblock in our 2015 event. Although most aspects of the event were proceeding apace (we had secured an great flight card including the Red Arrows and the last display of the Vulcan among others), we were forced to relocate the event due to unexpected costs from Southend Council. Since then we have been working all hours to locate a suitable venue both in and out of Southend for this years event. This was a controversial act however, we decided that not trying to save this event would have been a mistake and the fact that we were so close meant that we would have regretted not at least making the attempt. I wish we could say today that we had secured that venue and we would have an Airshow this year but that is not the case. Although negotiations with great a location were developing, we could not get it signed by last Friday when a deadline placed upon us for RAF commitments expired. This has been a two year project to return an Airshow to our seaside town. A labour of love that has meant working evenings and early mornings. One that has taken hundreds of hours of our personal time away from friends and family (I remember being on the radio to promote the campaign on the due date of my first child.) and required vacations from work. We now have to face the reality that although there may be other Airshows in Essex in the coming years, we will not have an Airshow in Southend. Its been quite a journey, from two people and a Facebook campaign to a team of nearly twenty and over twenty thousand supporters. To those that donated to the cause we thank you and we will we will donate that money to our nominated charities. To our sponsors I would like to thank you for your assistance and aid. To our community, I apologise for letting you down, it was your support that even made this crazy idea a remote possibility. Though we were ultimately unsuccessful I stand by our effort, I still believe in Southend and think that is a fantastic town, one that has so much to offer. It is just a shame that we will not have a marquee event to promote it." The inaugural Southend Airshow & Military Festival is set to take place on September 12 and 13, 2015. It had been hoped to bring back the show this year, but the Southend Airshow Community Interest Company found itself £70,000 short of the required £150,000. This has now been overcome and the show is set to become an annual fixture in the Southend events calendar. Headline sponsor is the Toomey Motor Group who joined a broad range of businesses, which have helped to bring back the show after it was axed by Southend Council because of the costs involved. Donations from members of the public have also reached £1,800. The show has been resurrected thanks to airshow enthusiasts Thomas Curtis and John Delaney. Mr Curtis, director of media and communications, said: “There is no doubt in my mind that Southend Airshow & Military Festival will be the highlight of Summer 2015, the team has worked incredibly hard over the last year and a half to create a fully costed, workable and sustainable event that Southend can be proud of and put the town on the map. Mr Delaney, director of sponsorships and partnerships, added: “Its been a long haul to get here and I am delighted we can now look forward to an Airshow in Southend for 2015. The event takes place on the recognized Battle of Britain weekend but the weekend of the 12th will also be the 75th anniversary of the Battle of Britain. THE Southend Airshow & Military Festival has been postponed until 2015. A funding shortfall has lead organisers to postpone this year's inaugural event. They say they have been unable to raise the final £35,000 required to secure the show. 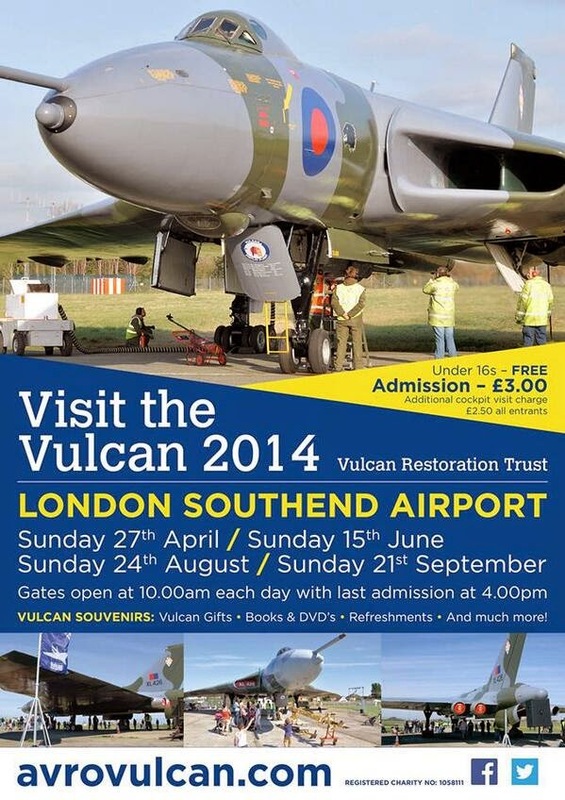 See the Vulcan at Southend Airport. John Delaney and Thomas Curtis received final approval from Southend Council to run the airshow in July. The pair stepped in after Southend Council said it could no longer afford to run the popular annual event. In less than a year the team raised £185,000 sourced from sponsors including Headline Toomey Motor Group. Thomas Curtis said: “Though it's undoubtedly a sad day for myself and the team, postponing the event to 2015 does not remove the achievements we have made this year. was scheduled to take place on the 6-7th September 2014 Subject to sufficient fundraising. Latest: In continuing bids to raise funding to bring back Southend Airshow, Toomey Motor Group, a leading car and commercial leasing chain, has stepped up to become the Headline Sponsor. Toomey, which have locations in Southend, Basildon and Orsett have agreed a wide ranging financial partnership with Southend Airshow & Military Festival. Southend Airshow was one of Europe's largest free airshows, running for 27 years. But in 2013 it was cancelled by Southend Borough Council as part of budget cuts. A small team of individuals has been working since to return the popular event to Southend-on-Sea by raising private funding. The team decided to move the new Southend Airshow and Military Festival from the traditional May bank holiday weekend to the 6-7th September, but need to raise £150,000 to ensure the event becomes a reality. John Delaney, one of the individuals behind the Save Southend Airshow campaign said: “Since we first started putting together the plans to bring back the airshow, I've always believed we would be able to secure a headline sponsor due to the high profile and significance of the event and the opportunities it presents. He continued to say: “Toomeys is the leading commercial and consumer vehicle leasing provider in the region and highly regarded in the town. I am glad that the community and local businesses are coming together to support both Southend-on-Sea and Southend Airshow & Military Festival." Whilst the sponsorship from Toomey is a significant one, there is still a need to raise further funds to allow the event to proceed as planned this year and the organisers are keen to speak with companies interested in becoming Sponsors. The Southend Airshow first ran on 26th May 1986 as the finale of the Southend Spring Festival and is the largest free airshow to take place in Europe. Southend Airshow has attracted many aircraft and display teams in the past including; The Concorde, The Red Arrows, Frecce Tricolori, Battle of Britain Memorial Flight, RAF Falcons, the Sally B Boeing B-17 Flying Fortress, A10 Thunderbolt, Hawker Siddeley Nimrod, Avro Shackleton, Hawker Sideley Harrier, Vulcan, F117a, Vickers Viscount, Boeing 737, 747, 757, 767, the Saab Draken and a Catalina flying boat. Naturally the airshow is a highly popular annual fixture for Southend-On-Sea and in the nearly three decades since it launched it has drawn millions of attendees from all over the United Kingdom and Europe. In 2013 by Southend Borough Council announced its intention to cancel the event citing budget cuts and lack of sponsorship. In response to this announcement Thomas Curtis and John Delaney formed a campaign to ‘save the airshow’ and raise awareness of the Council’s impending vote. What followed was a whirlwind of social media, newspapers and radio interviews including: BBC Online, BBC Essex, Radio Southend, Heart Essex, GatewayFM, Evening Echo, Southend Standard and the Yellow Advertiser. Sadly in spite of the effort and the largest demonstration ever seen at the Civic Centre, the Council chose to cancel the event. Goodbye Southend Airshow, hello Southend Airshow and Military Festival! However all was not lost as Thomas and John decided to continue working to return the event to Southend! In the short time since, both Thomas and John have been working hard to secure funding, expertise and partnerships to make the event a reality. On the 26th July 2013 the new name for the airshow was unveiled: Southend Airshow and Military Festival! The team has also elected to move the event from the traditional May bank holiday weekend to the 6-7th September. The reasons behind this are simple, the weather is generally better in September which will ensure that we can run a full flight card and by having the event later in the year we can provide an added boost to the local economy in an otherwise quiet period. The event will continue to be free to attend and we are anticipating in excess of 500,000 attendees bringing with it millions of pounds in revenue for the local business community. At its meeting on Tuesday 22nd January the Cabinet approved Southend-on-Sea Borough Council’s draft budget for 2013/14 to cancel the Southend Air Festival - see council_budget. Southend Borough Council announced on Monday 14th January 2013 that it planned to cancel the popular Southend Airshow in it's efforts to cut costs. By scrapping the annual Airshow, which brings thousands of tourists to Southend, the council say they will save £130,000. The Southend Airshow would have been in it's 28th year. There has been an Airshow every year on Southend seafront since 1986. 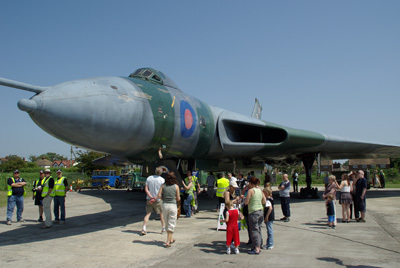 Southend Airshow and Military Festival selects the Vulcan Restoration Trust as beneficiary! Southend Airshow & Military Festival is proud to announce that the Vulcan Restoration Trust is to be a beneficiary of the event scheduled for 6-7th September 2014. The Vulcan Restoration Trust owns and maintains Avro Vulcan B2 XL426, based at London Southend Airport. The Vulcan Restoration trust has worked incredibly hard to maintain the much loved Vulcan and its a iconic part of Southend’s history. The Vulcan Restoration Trust joins Soldiers’ and Sailors’ Families Association, The RAF Benevolent Fund, The Royal British Legion and Help for Heroes as charities selected to benefit from Southend Airshow & Military Festival. The chosen charities will receive a percentage of the profits generated from the 2014 event and beyond. “Southend Airshow & Military Festival is more than just creating an event, its about giving back to the community. The Vulcan restoration trust is a team of dedicated enthusiasts works hard to keep a part of our nations military heritage in working order and we couldn’t be more pleased to support them. Southend Airshow & Military Festival 2014 will be staffed by a dedicated team of over 300 volunteers coming together as “Event Makers” to make this fantastic free community event successful and unique. Volunteers will be involved in many aspects of the show, from marshalling road closures, answering visitor questions etc to selling programmes. Each volunteer that helps at Southend Airshow & Military Festival 2014 will be entitled to free refreshments throughout the day including a packed lunch, plus be part of a great experience to add to your CV or personal interest, meet new friends with similar interests and be involved in this spectacular community event to support our heritage & military. Looking for Southend Airshow May bank holiday weekend ? What date is the Southend airshow on in 2014. CLICK HERE. I'm going to miss the Southend airshow. It was a tradition of mine to get a room in one of the cheap hotels in Southend and enjoy the airshow and the seafront over the weekend.